The Luigi death stare meme from Nintendo's Mario Kart 8 is kind of like dramatic chipmunk. Luigi peers into your soul. Nintendo’s Mario Kart 8 for Wii U is a big hit. Released in May, it has won positive reviews and a big fan base. 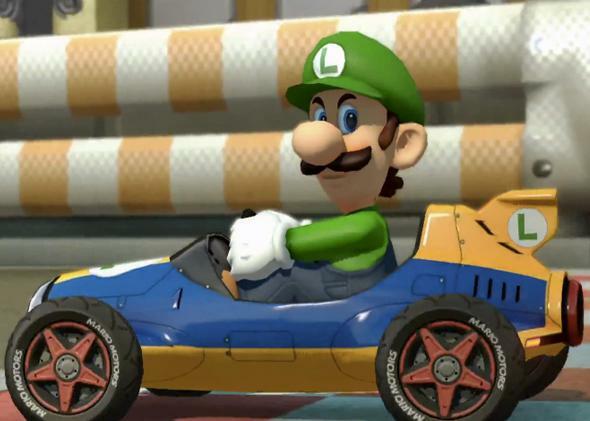 But the meme that has emerged from the game has nothing to do racing or Mario himself—it’s all about Luigi’s death stare. And Nintendo’s new ad for Mario Kart 8 (below) is definitely milking the craze. In the promotional footage of Kart 8, when Luigi executes a good move, like bumping another driver or hitting them with a shell, he makes a weirdly evil, even maniacal face. I always thought there was something a little bit sinister about Luigi’s engine room in the original Mario Party, but this confirms it. Maybe he resents being portrayed as Mario’s dopey sidekick in game after game. Gif by Lily Hay Newman. Whatever the explanation, Luigi’s death stare supports a meme theory I’ve had for awhile now: It’s always funny when someone (or an animal) looks back over his shoulder at you. Dramatic chipmunk couldn’t have reached such notoriety without that unintentional physical comedy. Even robots channel it a little bit. All that side eye really shows that Luigi and the chipmunk mean business.